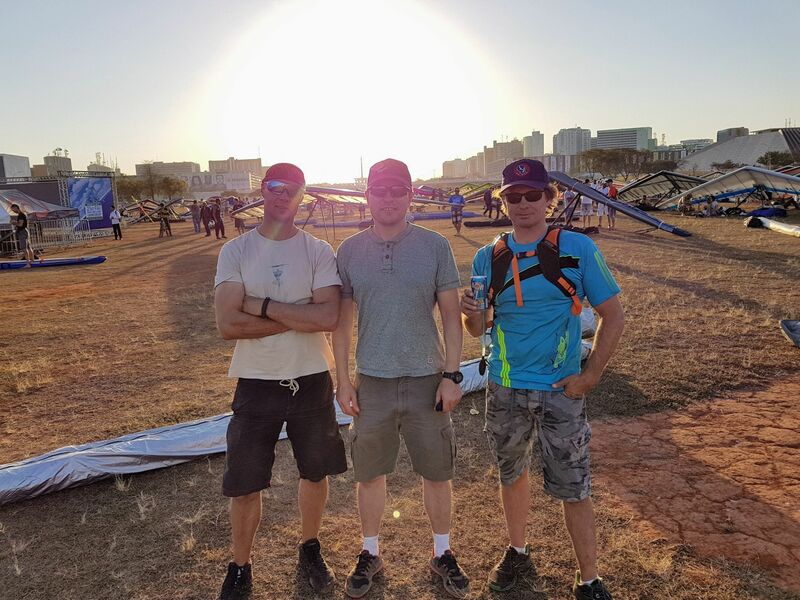 Day 2 and a 123km task back to the goal at Espanalada in Brasilia, the first pilot off the hill was Wolfi, into a bad cycle with very weak conditions that left him on the ground in 10 minutes. The launch was then closed for a while due to crosswind, before pilots started taking off as we watched the Vultures showing us the thermals. Olav was early in the launch order and sunk out quite low beneath takeoff before getting up. I did a very bad takeoff, my left wing dropped just as I picked up speed, and I had to use full weightshift to avoid turning back into the hill. The the zipper rope had a knot in it, so I could not close my harness until I found a lift that got me high enough so I could take my hands off the speedbar, which took around 15 minutes. Then I was super thirsty after the struggle to get up, but the camelback hose had a kink inside the harness, so no water for me today. I did not have enough time to get the height for a good start, but it turned out OK as I found a good line coming back from the startgate and towards the first TP I could push to catch some of the pilots in front. After the first TP I pushed a little too hard, and had to stop in weak lift, loosing sight of the lead gaggle. From there it was an OK flight to goal, except when the YotaPhone crashed just as I came up to the 3. TP, it restarted by itself, but as I had just taken the TP it was pointing the wrong way and I had to to reprogram XC Track again. Going on final glide we had a small gaggle with 5-6 gliders around, we had to stop around 14km out in weak lift, and I left it on 9:1 glide, hit the main thermal that you always find on final glide and shot up into the sky like a rocket gliding as fast as I dared. I came out of that last thermal with a 4:1 glide, so I had no problems making goal…. Setting up the landing I jammed the zipper in my shorts, and had another adrenaline filled minute trying to solve that problem while on downwind with 10 other gliders in the same position. To top that off the brakechute had twisted lines and did not open as it should, but I pulled off the landing anyway. Oh, and I should mention that my new YotaPhone fell out of the car and broke the e-ink screen this morning. What a day! Things can only improve from here though. Olav did a really good flight again, coming in just after the leaders at 17. place. I was mid-field at 67. and Johnny had instrument problems and missed the last turnpoint with 27m before flying to goal, and lost some places ending up at 102. More than 100 pilots in goal today of total 134, skill level is high for sure! Wow! Sounds like a rough day. I hope you have less challenges in the remaining days.